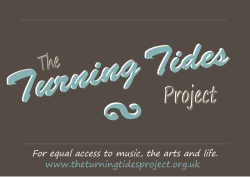 The Turning Tides Project believes that everyone has the right to equal access to music, the arts and life. with 'learning disability' or 'autism' labels in Devon. Our focus is on the work that we do and the difference that we make. The Turning Tides Project takes a Social Model approach.